One of the reasons I left my home, my job and a very cozy place is to find a certain environment that I’m going to fully enjoy. Changing my location regularly requires a whole lot of critical awareness about my current environment. Having changed places before, I know about the honeymoon phase. Even being totally amazed by how different a new city feels, I’m constantly trying to remain conscious of that phenomenon. Madrid por ejemplo is a typical European international capital with recreational areas, business districts, a vibrant city centre and an outstanding public transport network. It’s easy to navigate and even in Spring, it appears to be a place of eternal summer. Palacio de Cristal, a perfect spot for a 360 camera. Someone almost knocked it over. However, there’s a slight difference compared to Germany for instance: People are a bit more open (at least in Madrid, Valencia is another story) and you don’t get those weird wary looks in their faces too often, regardless whether it’s an older couple, young boy or attractive Spanish girl in her twenties. Due to my tan and black summer hair, most people try to talk to me in Spanish first. Carrying a tiny white plastic bag from those extraordinarily useful 24h shops allows me to blend in easily. On top of that, I don’t walk slowly because I know where I want to go at any given time. That applies to getting lost intentionally as well as strolling parks, suburbs and crowds. It’s a pleasure to dive into the city life. I expected nothing and ended up with a place to sleep right from the first day, people to practice Spanish and remarkably pleasant company to explore Madrid with. The sweetest couple in town. I like those colors! Honeymoon? Hell yeah, but that’s my reality for now. Cautiously assessing those circumstances leads me to this statement: Change is as real as it gets, notwithstanding the heavy burden of being frustrated of, adapting to and finally accepting a place. I had some talk about “Reality” recently and I believe that very often, life is misunderstood as merely existing. Sadly, a lot of people cannot choose to leave a place easily so finding new means of freshening up your mind from within isn’t always straightforward. I admire people who manage to constantly push change regardless of their daily struggles and I got an impression that this feels real to them and they are prone to forget times that lack change. That takes me to the last stage of settling down at a place: Acceptance. The time which people usually call “real life”. I call it “waiting to die” and it’s not a time that you’re going to remember. Of course you might take some notes of highlights (usually pictures of a family vacation or the like, which I think is a wonderful thing to happen) but if someone were to ask you about that time 20 years later, you would probably respond: “Oh, it’s been 20 years already? Wow, time flies …”. I don’t know about you, dear reader, but I heard that statement quite often in daily adult life. Las chicas del cable, a Netflix exclusive which is hyped right now in Spain. That picture was taken around 10 pm at Puerta del Sol in Madrid. Even during the day, there are no clear walking paths for pedestrians there. A wonderful place to just sit and watch or to interact. The four stages are based on some articles regarding expat life or moving abroad in general. They not only apply to moving abroad, but also to changing your job, making new friends, starting to study, breaking up, dying(?) or any other common life event. That graph alone is subject to discussion and it’s probably going to be revised during the next weeks. 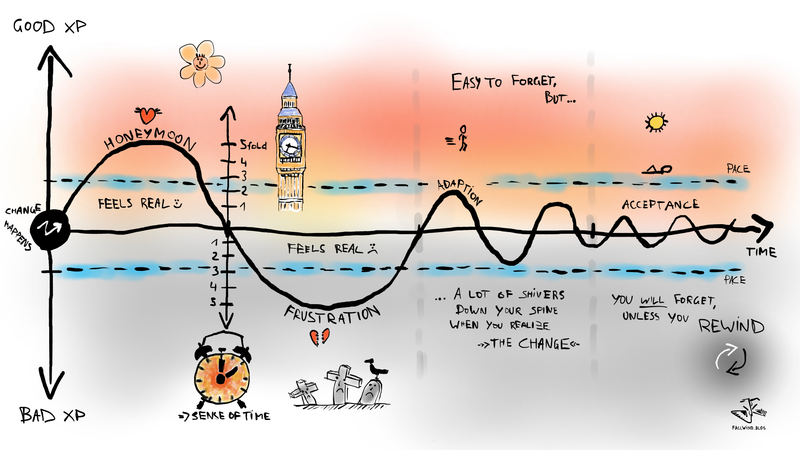 How do you feel about that emotional cycle? Do you recognize anything or did you maybe experience something beyond that graph’s canvas? Also, do you know some other songs which might be a good fit, especially ones that you like to listen to when introspecting? Have a good day! I’m off to Valencia now, voy a la playa. A propósito de españa, escucha esta canción en español, sobre los cambios en la vida. I agree with the phases… however, I think is really hard to stay in the honeymoon phase permanently… The secret for life it’s keep looking, thought.